The 2003 Carnival city Convetion was hosted by Ovar Portugal. Their special summer parade produced for the FECC dignitaries has now become an annual tradition in addition to their 50+ year old parade, which is the most acclaimed Carnival parade in Portugal occurring before lent. The FECC-USA and the FECC-Netherland Antilles are very interested in more Carnivals of the Americas of the Americas joining the FECC and helping us promote your Carnival internationally. Carnivals are defined broadly as annual events usually with a parade and celebrating spring and/or traditional ethnic arts of song and dance. By Odessa Pegus, General Deputy-U.S.A. The year 2000 marked my introduction to Foundation of European Carnival Cities (FECC). I was invited to attend the 20th FECC Convention in Santa Cruz de Tenerife, one of the Canary islands owned by Spain. This annual meeting was attended by 229 participants representing 29 countries. Following a week of phenomenal activities my decision was made to join. 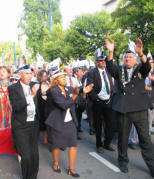 The FECC is an international carnival Association founded in 1980 at a reunion of friendly countries in Patras, Greece. Previous to this Reunion Mr. Henk van der Kroon, president of the Amsterdam Carnival, presided over the City of Amsterdam's 700 years Celebration and began contacts with the first member countries. During the fifth Reunion in 1985, held in Kos-Patmos, Greece, rules were set up and an official membership was established. The first countries who became members were: The Netherlands, Belgium, luxembourg, Great Britain and Malta. A non-profit organization bearing the name Foundation of European Carnival Cities was registered in the Court of Petange, Luxembourg. In May 2004, during the annual FECC Conference held in Pernik, Bulgaria, a majority vote resulted in a name change from "Foundation" to "Federation" of European Carnival Cities. The main objectives of FECC are to unite world carnival cities in the exchange of ideas and opinions related to Carnival. It collects and preserves knowledge about carnival customs and traditions throughout the globe. It promotes exhibitions and advertising without losing sight of proper national identities. FECC also stimulates youth participation in national carnival activities and encourages cultural exchange programs for youths among member countries. Carnival is not only a cultural phenomena, it's also a global industry. FECC collaborates with carnival cities in the continents of Europe, North America, South America and Africa. Presently, outreach activities include Asia. FECC organizes 2 events annually. During springtime (April, May or June) the International FECC Convention is held. A less formal event called "Gala Dies Natalis" (annual birthday celebration) takes place between the dates of September 25th and October 15th. This is an exclusive gathering for members that is a celebration rather than a meeting. These events are always hosted by different member countries. At a typical FECC Convention there's an opportunity to meet representatives of world carnivals and the chance to satisfy your curiosity about the host country. Each country puts its best foot forward by showing off its most prominent features. You will reside in luxurious hotels, eat delicious food and be escorted to some of the most fascinating places. The program includes a Presidential meeting (Presidium), a General Assembly, several workshops and guided tours. During the workshops participants share their country's Carnival experience and interact with local authorities and organizers from the host city. Translators are provided to assure that language is not a problem. 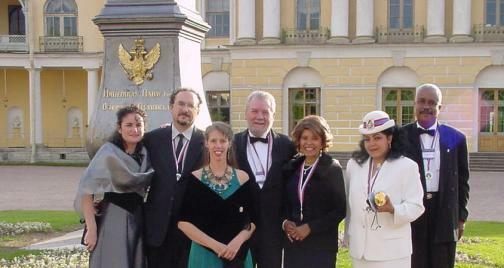 During 5 years of membership in this unique organization I have gained incredible knowledge, established ongoing friendships in many parts of the world and satisfied my desire to see the world. No other organization that I know of could provide such an opportunity. The interesting and exotic cultures of the various countries have greatly enriched my life. Every host I've visited has welcomed me, a stranger, into their world and made me feel at home. FECC proudly boasts over 500 members and organizations representing 100 cities in 52 countries that support its work and its growing member network. Carnaval San Francisco is a member proudly representing America and participating in FECC's activities and growth. 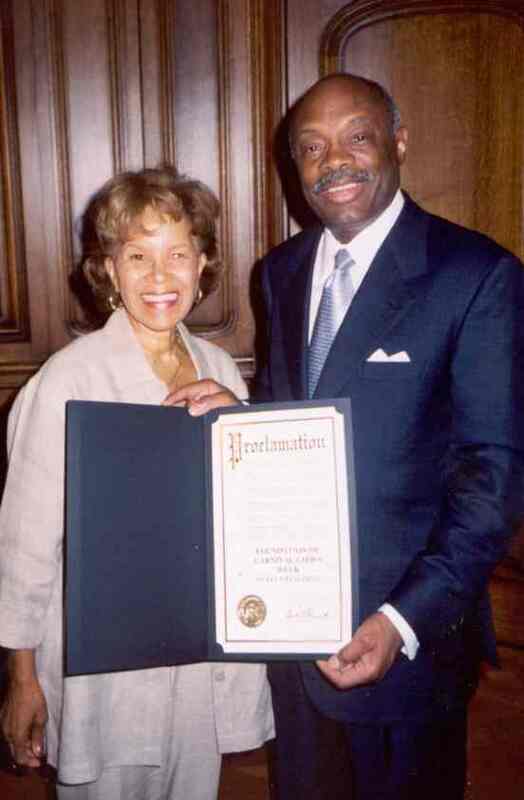 Willie Brown presents a proclamation honoring FECC. Mayor Brown also helped to fund the San Francisco Museum of the African Diaspora which will have a permanent exhibit devoted to Carnival. Visitors will learn how Africans everywhere celebrate life cycles through gatherings that place special emphasis on color, seasons, movement, and clothing. Carnival has become part of the social fabric from Trinidad and Rio to New Orleans.